Marty Flynn thinks Mick Hall has been too generous in his appraisal of both Martin McGuinness & Gerry Adams. I attempted to reply to a piece by Mick Hall earlier. So, apologies for the delay. My previous attempts have mysteriously disappeared. Is this a warning from beyond the grave perhaps? What I most definitely do know is that the signals up here in the hills above Falcarragh are like quisling $inn £eind promises: here one minute gone the next. But we endeavour to have our say come what may. Mick Hall said in his post that Martin McGuinness was a fearless and resourceful soldier. Mick how do you know this? Were you a witness at first hand so to speak? After all a lot has been said on a few blogs re this man’s history i.e. tout agent, asset etc. Many have stated, including myself, that they believe that this man was a protected species. This comes from what they have suffered personally, witnessed or observed re this man. Also from taking onboard statements from former British soldiers and ex RUC who have stated as much. In such circumstances it would be easy to act the hard man, as we say here, and come to the conclusion that he has been either or all of the above. People like Anthony and Simon argue that there is insufficient proof to lay such allegations. Taken this as so then that opinion of Mick Hall’s is no more valid than those of us who believe the opposite to him. As for Martybroy’s history as a quisling micro minister, Mick Hall must be having a laugh. By his own admission and terminology, the DUP have made fools of him and his quisling cronies these last 10 years, and as such his leadership abilities must be called into account. They have been more than abysmal in their representation of their constituents. A united Ireland is further away than ever. Jobs and job creation? Well, West Belfast, Strabane, Derry remain the industrial wastelands they have always been, The only employment created is that in "community jobs" for family and cronies. As for education? Martin McGuinness scrapped the 11+ and the DUP have since brought it in through a back door. they also have been responsible for closing schools. Health? Well the queues and waiting times speak for themselves. Austerity? They ran away from that. The Irish language Act? They made no mention of in their programme of government in January. Yes, they in their love for the "peace process " filled their boots and a few graves. Other than that, they have been damn useless in any form of representation. Also remember the RHI scandal? They were aware of that for over a year and yet said nothing: hypocrisy how are ye! As for Gerry “It wasn’t me” being less vengeful, do you not recall Jean McConville and the Disappeared? I suggested before to Mick Hall that he needs to take off those tinted glasses and look at these people in a proper light. I would love to claim ownership of the catoon that accompanies this post but alas not so, it is the reworking of one that I sent to Anthony and Carrie has added a far better caption ,perfectly encapsulating the brass neck on the quisling $inn £eind president for life and beyond..
That was indeed a perfect cartoon and one that got a laugh here. And commenting here is problematic, I don't think it is spooks or the hills of Donegal. In my opinion it is the absence of proof that is the problem or the crux of the matter. However, coupled with what we now know, experienced, read or been told etc we can have an informed view. 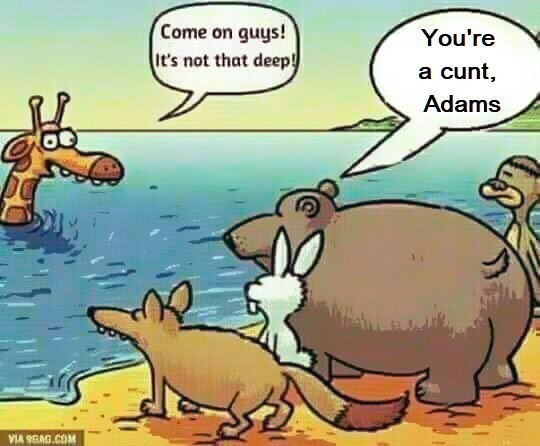 Given the seriousness the onus of proof is on those that were involved including Adams to prove their integrity and that of deceased comrades. Unfortunately Mr Hall's article did not do this, in fact it added to confusion.